Ho'oponopono for the Doctor's Soul: From "Smoke Gets in your Eyes" to "You are My Sunshine"
From "Smoke Gets in your Eyes" to "You are My Sunshine"
I've just returned from a remarkable weekend in Woodland Hills, CA: attending one of Dr. Ihaleakala Hew Len's ho'oponopono seminars as a "review" student. Though the photo above is NOT Dr. Hew Len, it does depict the joyful (and somewhat impish) spirit he shows. Why would I attend a review session? Certain information remains the same, but each group and weekend experience is different. I always find new or deeper insights in what's shared. Even more importantly, I commit to the cleaning process itself -- again and again and again. It's a constant re-tuning for use in every moment. All seemed normal enough this weekend, until I awoke early Saturday morning in my hotel room to the smell of . . . wood smoke! No such smell was present when I went to bed. Where could this be coming from? I looked out the window: no flames or barbecue going on. I felt the door: no heat. All seemed eerily silent; no fire alarms were going off. And unlike earlier in the evening, even people in the neighboring rooms were quiet. The TV in my room wasn't working (alarming in that context!) so I called the front desk. People there assured me all was well in the neighborhood. It turns out that several fires were raging in both Orange County and the Sylmar area -- fanned by record Santa Ana (aka "devil") winds gusting to 70 mph. People were losing their homes as burning embers hop-scotched across canyons and neighborhoods. Like the rest of Los Angeles, Woodland Hills received smoke, smell, and ash. Several freeways going through Orange County were closed, but our immediate area was safe. Dr. Hew Len and others arrived on time as planned, and offered these events as yet another opportunity to take 100% responsibility. "When one of us is stuck, we're all stuck," said Dr. Hew Len. "Nobody can be at Zero [as Divinity originally created us] if you are not at Zero. The way to be at Zero is non-stop cleaning. It's not about the fire -- it's about memories replaying in us. The only purpose for coming into life is to get un-stuck, to let go of memories replaying." Whatever "problem" we experience in the present is like a cloud -- or even like smoke -- obscuring something always present: the light of Divinity in us. Through repentance, forgiveness, and transmutation, ho'oponopono removes the smoke so the light comes through clearly again. Dr. Hew Len showed this over and over again. Further, he insists that even when we choose to do the ho'oponopono process, we never know exactly "what" we're cleaning. Divinity knows, but our conscious minds are clueless. We're constantly making choices to hang onto the problem, or let go. Humans telling Divinity what to attend to seems pretty silly -- yet how often do we do exactly this with our "goals" and "intention" lists? "When you're at Zero" [through moment-to-moment cleaning] that's where Inspiration is," he said. "You want the perfect relationship, money in the bank, or your perfect career? It's at Zero and nowhere else." He offered ways to care for our inner child [our "unihipili"] so that it feels safe and loved. "If you train it well, it will do the cleaning for you," said Dr. Hew Len. "Your relationship with your inner child is the most important relationship you have." How do "regular" people -- not just Dr. Hew Len -- use ho'oponopono? Do they notice effects in their lives? A psychologist shared about her work with ho'oponopono in patient care. As people talk about their difficulties during their sessions, she inwardly says, "I love you" to whatever arises. Somehow people come to their own healing much more smoothly; also, anything she says while doing this process is more likely to be from Inspiration than from her own conflicts (or "memories"). Work seems easier, and people get well sooner. And though she didn't "intend" a busier practice when she initially started ho'oponopono 3 years ago, things have evolved this way. Hers wasn't the only story. Another woman spoke about her husband's construction business growing from $50,000 a year to $6,000,000 per year -- as she did her "cleaning" even in a so-called "down" market. Had I not been there, I would have missed meeting these people who use ho'oponopono in their everyday lives. 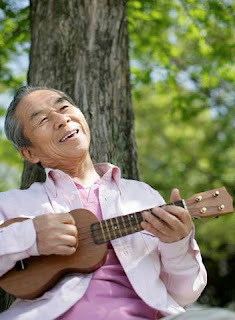 Also, I would have missed another wonderful treat not experienced in my previous seminars: Dr. Hew Len playing his ukulele and singing, "You are My Sunshine". Despite the economy, the war in Iraq, the nation's fears, and the LA fires, we all sang along with him. It was one way of caring for the inner child in each of us. Ho'oponopono cleaning doesn't have to be somber, as Dr. Hew Len illustrated. Just like a ukulele is tuned before being played, we can tune ourselves through ho'oponopono before our daily activities. The metaphor rings true. I'm so glad I made the trip -- and may Los Angeles and her people recover soon from those fires too.